Here are some notes to help you understand some of the terms involved with web hosting and websites in general. Not all websites are for business purposes but we can start off using the analogy of a website as a shop, or shopfront, to explain some of the terms and concepts involved. The first item on our list is the domain name. If the website is your shop, then the domain name is like the sign above your door. In fact it goes beyond that, because your domain name provides a unique identification of your website on the internet. So it's like your sign and full address combined. Like a trademark, it costs money to set up a domain name. This is called registering the domain name. Then you have your "identity" on the internet. A domain name's registration must be renewed, typically yearly or every two years. The company that does this is called a registrar and is said to "manage" the domain name. The yearly cost to have a domain name registered is usually of the order of a few pounds. Web space is like the actual "space" that you rent for your shop in the shopping centre. In hosting terms it equates to the physical disk space that is allocated for storing your website's files. There is a monthly or yearly charge for this. Shops in a real shopping centre can be charged thousands of pounds per month for a decent space in the shopping centre but you can get basic web space for around £50 per year, or even less sometimes. 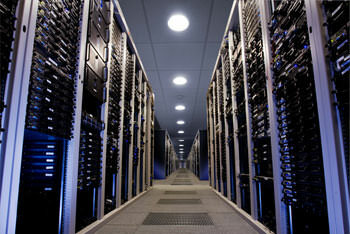 Your website is stored on a web server, which is a server computer that is connected to the internet and configured for delivering output for the web. A domain name is associated with a website using the Domain Name System (DNS). The entry for this in Wikipedia reads as in the section below. You can skip it if you like! The Domain Name System (DNS) is a distributed hierarchical naming system for computers, services, or any resource connected to the Internet or a private network. It associates various information with domain names assigned to each of the participants. Most importantly, it translates domain names meaningful to humans into the numerical (binary) identifiers associated with networking equipment for the purpose of locating and addressing these devices worldwide. An often-used analogy to explain the Domain Name System is that it serves as the "phone book" for the Internet by translating human-friendly computer hostnames into IP addresses. To the uninitiated that might seem obscure and technical, to say the least, but do not worry! The essential thing to appreciate is that every device connected to the internet has a unique, special number called an IP address. "IP" stands for Internet Protocol. Just as your house number and postcode identify the location of your home, an IP address locates your website, or at least the server (or cluster of servers) where your website can be found. However, humans prefer words to numbers, and the Domain Name System is the system that turns a domain name into the appropriate number, namely its IP address. Here's an example. If you enter the address "http://173.194.36.104/" into the address field on your web browser, you will find that it displays the Google main page. You get the same result if you enter "http://www.google.co.uk". This is because the DNS translates the name "google.co.uk" into the number "173.194.36.104", which is the public IP address for the Google website in the UK. We all know what an email address looks like. The crucial thing is that it includes your domain name, so that if your domain name is veryfinefencing.co.uk, then your email address will be of the form, "sales@veryfinefencing.co.uk" or "john.smith@veryfinefencing.co.uk". It is common practice in business to use the full stop to separate first name and last name. But if someone has managed to get their own family name registered before anyone else, sfor example barker-smith.com, they can take advantage of the domain name and set up email addresses like henry@barker-smith.com and felicity@barker-smith.com. When the web was in its infancy and websites were first appearing in the mid-1990s, websites were very commonly made up of static (that is, unchanging) web pages. You can think of such a website as being a bit like a brochure. Such a website was made up pages of text formatted in HTML, which stands for "HyperText Markup Language". The website would be updated infrequently. Doing so was not a straightforward process and required a little bit of technical know-how, such as understanding of HTML (just mentioned) and File Transfer Protocol (FTP), which is how you save your files back to the web server. Nowadays websites are much more dynamic and interactive and they require technical knowledge to build them. This is done using clever code behind the scenes plus a database, which work together to bring you a richer and more dynamic user experience. The emergence of websites that can interact with the visitor like this gave rise to the term "Web 2.0" - the trend of the next-generation of website technology. Such websites can provide features such as ecommerce (for example, Amazon and eBay), forums and blogs (think of Facebook and Twitter) and video (such as YouTube). The wide availability of these technologies means that you do not have to be one of the "big players" to have a website that can do these things. This is the designing and writing of the contents of your website - designing the shop floor and installing the cash registers, to push our metaphor or analogy a bit further. Website development has come a long way in the last 10 years and, as mentioned above, the expertise required to build, publish and maintain a website has been reduced dramatically by the advent of "power tools" and online services that empower all but the most timid user to do it themselves. For example, with the appropriate hosting package and using a free content publishing platform such as WordPress, a relatively non-technical person can have a basic blogging website configured and deployed online, ready to start filling it with content, in a matter of minutes. Internet Experts - Who needs 'em?! So, if it's so easy to publish and maintain a website, what's the need for a professional website designer? In fact, there is still a place for designers and developers and other internet experts. Why is this? As technologies have advanced, websites have become able to do more complex things, and so have our expectations of what websites should do for us. There always seems to be something required that is ahead of the curve and outside of the "easy to do" box, and with that comes a need for the various types of expert. Indeed, new types of experts inevitably become invented and needed as we progress and create new technologies. For example, the term "Search Engine Optimisation" (SEO) - the process of improving the visibility of a website or a web page in the search engines - is becoming a common term in the mainstream culture. People now talk about internet marketing and "driving traffic" to websites, and there are experts who make a living from it. Webmasters started optimizing websites for search engines in the mid-1990s: They would submit their website address to the search engine directories and place "key words" relevant to the website content in specially allocated parts of the web pages. These days the requirements and techniques involved have evolved to the point now where SEO is like a "black art" - and experts can command several hundred pounds per month optimising a website to achieve high rankings with the search engines.